R.W. Knudsen Family is both the name of a company and a brand of organic juices. The company’s headquarters is located in California, USA. R.W. 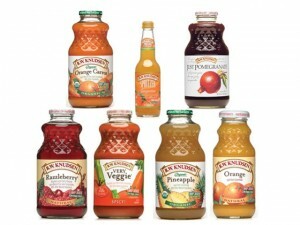 Knudsen started in 1961 when founder Russell W. Knudsen began his business of bottling juices from his grape vineyard. From the beginning, Knudsen was committed to never put preservatives, artificial flavors or sugars in his company’s fruit juice products. The company’s commitment to keeping everything all natural is what appealed to customers. Over the years, the R.W. Knudsen Family® became known for its health-conscious products. In 1985, the company became a member of the then newly founded OTA, or ‘Organic Trade Association,’ which supported the promotion of the organic industry. In 1997, R.W. Knudsen became the first food manufacturing company that volunteered to be certified as being an organic processing plant. In addition to its commitment to organic products, the company is also committed to taking care of the environment. In 1996, R.W. Knudsen started diverting more than 37,000 tons of trash from the local landfill through its recycling program. For seven successive years, the company was given recognition for its waste reduction, energy saving and recycling programs. Currently, the company produces more than 125 organic products; the most well known of these products is a line of non-carbonated, natural juices that are sold in 32 fluid-ounce glass jars. These juice products are available in different supermarkets and organic food stores all over the United States. Another popular product is the energy drink Recharge, which competes with Spritzers and Gatorade in the area of energy drinks. All of the company’s products are considered shelf-stable, meaning these do not need to be refrigerated. Because the products do not need refrigeration, they do not compete with refrigerated drinks such as Naked Juice and Odwalla. Other R.W. Knudsen products include juice concentrates, light juices, organic juices, fruit juice spritzers, non-alcoholic celebratory drinks, and specialty items. Almost all of R.W. Knudsen’s operations (product development, production and marketing) are done at the company’s headquarters.